This list of Pilgrimage Site are the Verso Ministries Top Pilgrimage Sites in Region 6. The Regions that will be used for all of our lists are based off of the Regions used by the National Federation for Catholic Youth Ministry (NFCYM) and used for the Bishop Conferences. These resources are here for Youth Groups, Young Adults, and Individuals to be able to find local sites to go on Pilgrimage to. An hour north of Dayton is the Maria Stein Shrine of the Holy Relics. Who would have thought that in a town of 2000 people, there would be the second biggest collection of relics (over 1000!) in the United States! The Shrine itself is comprised of two buildings, the Shrine itself and the accompanying Retreat House. With the incredible number of relics that the Shrine hosts, you would be hard pressed not to find the Saints you would want to venerate. Likewise, the sheer number of Saints and holy objects that you will be in the presence of cannot help but inspire a desire for holiness in all who visit. With the vast grounds in the wide open fields of Ohio and a retreat house that can host over 100 people, the options are endless for any group that chose to make a visit. Whether you come from a few hours away or a few days, this may just be one of the most special sites on all of our lists. Even in the few hours that I was able to spend at the Shrine in my own visit, my life was changed significantly and my desire to return someday only increases with every word I write about it. I would encourage groups to come visit in the summer, and if possible make it an overnight trip, in order to more fully experience everything the Shrine has to offer. Likewise, the grounds alone demand time set aside for exploring as there are so many sacred areas throughout dedicated for prayer and contemplation. For everybody in the midwest, this should easily be on any shortlist of potential pilgrimage sites! The Our Lady of the Woods Shrine is a hidden gem in the heart of northeastern Michigan. In the midst of a heavily wooded area and being hosted by Saint Mary Catholic Church, this shrine may be one of the most out of the way and smallest Shrines on our list. It was conceived of by Father Hubert Rakowski in the 1940’s and found itself completed in 1955. The Shrine, while dedicated to Our Lady, is in fact the host to multiple apparitions of the Blessed Mother as well as other Saints. While only a small ground that only lends itself to a few hours of contemplative and group prayer, I would strongly encourage groups to work with the parish to have a day long pilgrimage including talks, time for prayer and reflections, and of course Mass and meals at the Church and on the Shrine’s grounds. The possibilities for this as a day long pilgrimage are even more incredible than the woods that surround the little town that it finds itself in. So go enjoy the beauty of Michigan and honor the Blessed Virgin Mary all in one easy trip! Humbly towering above the city of Cincinnati sits the Shrine and Franciscan Friary dedicated to Saint Anthony of Padua. Founded in the late 1880’s, the Friary saw over a thousand men enter its doors as novices within its first 80 years and it is still run by that same order to this very day. 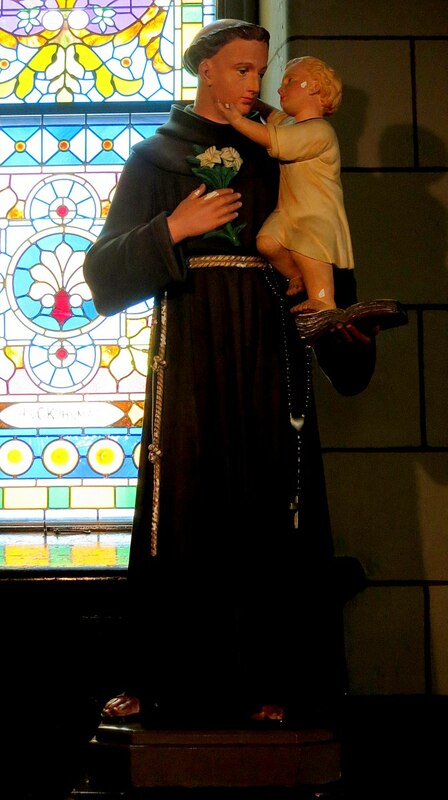 Inside the Shrine’s chapel is a beautiful statue of Saint Anthony with a first class relic of the holy man always reposed in front of the statue. Outside are the beautiful hilled grounds of the Friary with statues of Saint Francis, Saint Anthony, and Our Lady of Guadalupe. The Friars encourage their visitors to plan their own visits as (unlike most of our Shrines) there are no tours that are given. However, with the brothers and priests of the Order frequently found around the grounds, it is easy to encounter and spend time with the Franciscans that are there. This opportunity to meet one of the greatest preachers (Saint Anthony) and to spend time with such a holy order should not be passed up by anyone who has the chance to visit. If you have a Franciscan heart or spirituality, this is a visit that you cannot pass up! The National Shrine of the Cross in the Woods was constructed from 1948 until 1959 when it was finally completed. Originally intended as a simple parish for the people in the northernmost reaches of Michigan, the vision for the building of a Shrine on the grounds was shared at the dedication Mass for Church building in 1949. Today, the Shrine is home to Calvary Hill which hosts the 28 ft Crucifix that towers over all that visit it. The Cross however is not alone as throughout the grounds are also Shrines to St Francis, St Kateri Tekawitha, St Peregrine, The Holy Family, Our Lady of the Highway, and Venerable Fr McGivney. This is the perfect place to visit for all people traveling north or south in Michigan along Interstate 75. With the intention for the Shrine being a holy place for travelers along the way to visit for a few hours to enter into a time of prayer, turning any trip to northern Michigan a pilgrimage in its own right. So the next time you find yourself on the road through Michigan, keep in mind this tucked away holy site and make sure to turn your vacation into a mini pilgrimage! Perhaps the most famous part of Michigan after Detroit, Mackinac Island is the home to vacationers and locals alike. 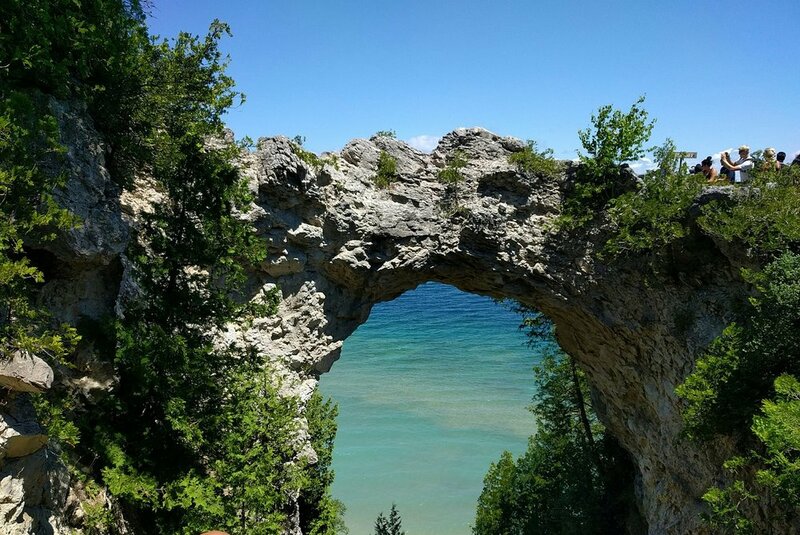 Considered to be one of the most beautiful places in the northern states, people from all over visit Mackinac in order to get away from life and let go of everything that attaches them to the world. So what better place could there be for a Pilgrimage to visit than a place that calls you into letting go of everything around you and appreciating that which God has made for us? Whether you go to swim, boat, hike, climb rocks, or attend any of the number of events on the island, you will find yourself entering into a prayerful time in the surrounding peace. Bring your journal and your favorite spiritual books and wait to see where God leads you on your trip. They even have their own Catholic Church (http://www.steanneschurch.org/services.htm) making it easy for you to spend your time on the island while still making time to honor the Sabbath! Let the Spirit guide you on this trip, and make it as memorable and unique as possible!